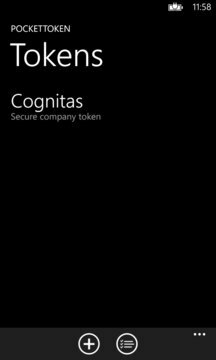 Published by Cognitas Technologies Inc.
Cognitas PocketToken is a two-factor authentication solution designed to be cost-effective, highly secure, and highly usable by leveraging user mobile devices as the second factor. Rather than having separate hardware tokens, users generate one-time passcodes on their Windows Phone device using the PocketToken app. Unlike traditional approaches, though, PocketToken has been designed from the ground up to address the issues of provisioning, management, and support--which together comprise a large portion of the total cost of any solution--without sacrificing usability. The PocketToken app can host multiple "virtual tokens," with each token protected by various layers of security as defined by the enterprise security policy. With PocketToken, enterprises can define provisioning and support processes in a manner that are largely self-serviced by the end-user, significantly reducing operational costs. Management and support processes such as setting and resetting PINs are performed "in-app" by the user, without the need to go through a helpdesk. With support for a range of popular mobile platforms, PocketToken brings the concept of "bring-your-own-device" (BYOD) into the authentication space.